Ladies and gentlemen, my very own version of Paella Valenciana! (applause!) Who would have thought that I will soon cook spanish and mexican dishes? Surprisingly, I am now into those things. I love spanish and mexican cuisine but one thing I don't like about most of their dishes---very hard to prepare. Good example paella. Imagine cooking paella for how many hours? Oh well, good thing I discovered easy way of preparing it. I shortened the preparation but surprisingly the result is more than what I expected. 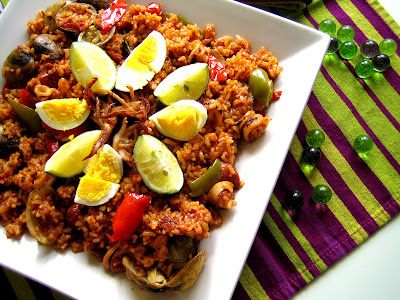 A delicious paella versus the paellas you can taste in food caterers or restaurants. On the otherhand I cannot conclude that my paella is better than the authentic spanish restaurants like UNA MAS and ALBA's. I can only guantee that I like it the way it is compared to other restos I have dined in. And according to people who have tasted it, it's deliciously good. This paella is made of ifugao rice then boiled and simmered with the broth of clams which I sauteed with garlic before putting it on the rice. Set aside the rice after cooking, prepare a huge wok then heat with olive oil. Then start sauteeing garlic, onions, tomatoes, green & red bellpeppers, green olives, giant squid rings, prawns and clams. Add cumin, saffron, salt and pepper. To make it a little bit spicy add spanish paprika. When everything is cooked, add the cooked ifugao rice to the wok with the rest of the ingredients. Gently mix them all together and pour red wine or sherry then add the remaining clam's broth. 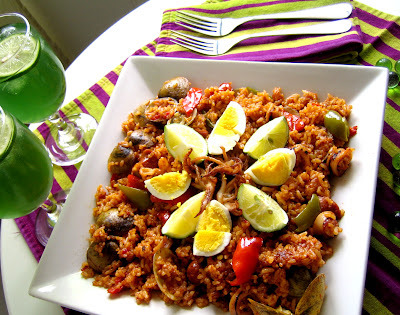 After cooking top with sliced hard-boiled eggs and diced lime.The paella is best eaten with my Green Tea Shandy. Another photoshoot during lunchtime. The light shining from my window is perfect at that time of the day. Photography, cooking, and food styling by yours truly.